The screen is black. We hear nothing but the sound of applause which slowly begins to settle as a man’s who is clearly talking into a microphone begins to speak. INT. A LARGE ART GALLERY. NIGHT. A man in his mid 40’s dressed in black tie is standing at a lectern on a small, well lit stage. On the wall behind him are several large framed photographs. He addresses a crowd who we don’t yet see. SPEAKER (cont) …but also as I’m sure you will agree is a true inspiration to us all. Ladies and gentlemen, my peer, and my dear friend, Maria Brenner! CUT TO: TITLES which come up in between shots of a very beautiful woman in her early thirties who approaches from the right hand side of the stage. She wears a floor length white satin gown and is smiling, although she is wringing her hands together and looks extremely nervous. She stands behind the lectern and nods to the crowd who continue to applaud her. The camera zooms in slowly and we see her gaze is fixated on someone who stands in the crowd in front of her. The applause fades, the screen goes black. INT. MRS BRENNERS HOUSE. MORNING. We see an immaculate woman with dark hair swept up in a glossy bun. She looks very sophisticated and stands in the hallway talking on the telephone. It is clear by the decor and her dress that we are no longer in the present day. She looks extremely agitated and takes long drags of her cigarette in the pauses of her conversation. She covers the mouthpiece of the telephone and looks to the ceiling. She then removes her hand and returns to the conversation. MRS BRENNER: I know that…yes I know…oh for Chrissake Fred I don’t have time for this right now! She slams the receiver down, sighs and stubs her cigarette out aggressively into the ashtray by the telephone. Nine year old Maria sits in a small single bedroom, the room is very plain with a bed at the far end and a small bedside table next to it. We can see underneath the bed are two coloured storage boxes which are filled with toys, yet none are present in the room. She sits on the floor wedged between the end of her bed and the wall. We hear her mother’s cries again and she covers her ears. We then see from her POV looking at the door as we hear thuds of someone coming up the stairs. The door then opens and Mrs Brenner stands in its frame. MRS BRENNER: Maria! I told you we have to go out, why aren’t you ready? For heavens sake girl get up! She marches over to her and pulls her up by the wrist. Maria struggles away looking fearful, and presses herself further into the corner of the room. Mrs Brenner then kneels down beside her and tucks a strand of Maria’s hair behind her ear. MRS BRENNER: We have to go out love, I can’t leave you here after what happened last time. We discussed that remember? I’ve got things to do…Do you want to wear the glasses? The glasses always help a bit don’t they? Maria looks up and bites her lip, she then nods reluctantly. Mrs Brenner is marching purposefully down a fairly empty shopping street. She is clutching a clearly reluctant Maria’s hand and holds several shopping bags in the other, her mouth is set in a determined line –she is clearly ignoring her daughter’s reluctance and upset. Maria wears hugely oversized dark sunglasses which she has to keep pushing up to stop them from falling off her face. The camera changes so we see from Maria’s POV and we can sense her fear and hear her breathing. They stop outside a photography shop and Mrs Brenner lets go of Maria’s hand to smooth down her jacket. The bell tinkles as they enter. INT. HARRY’S PHOTOGRAPHY SHOP. MORNING. The shop is small and very disorganised. There is a counter with a till on it on the far left and a small door at the back. There are piles of frames in different shapes and sizes stacked up all over the floor. Several photographs hang on the walls and there are some shelves displaying different types of camera for sale on the right. A distinguished looking gentleman in his early 50’s emerges from the back door and his face immediately breaks into a smile. Mrs Brenner rushes over to him and kisses him gushingly on either cheek. MRS BRENNER: Harry! Have they come in? HARRY: Come through, come through, let’s see what you think. They disappear through the door at the back and the camera pans around to Maria who stands in the middle of the shop, very still, staring after her mother. She still wears the sunglasses. She very slowly turns and steps towards a pile of the frames which are stacked up unsteadily around her. As soon as she does they topple to the floor. She darts away and tried to press herself into the corner of the shop, visibly alarmed. The camera pans around so we are seeing from Maria’s POV. David’s head has popped up between the stacks of frames where he had been previously concealed. He looks startled and then his face softens when he sees Maria. He gets to his feet. He is a tall, lanky man in his early twenties with a hint of a moustache and slightly eccentric clothes. DAVID: Don’t worry about that, we’ll have them stacked back up again in no time. He walks over to the pile and begins to stack them back up whistling as he does so. Camera pans round to Maria who very cautiously gets up and walks over to a metal chair by the counter, she sits down and watches him carefully. When he is finished, he turns back towards her. DAVID: Now then, now then. If I remember correctly, last time you were here I was telling you about the different types of camera’s we have. Now this…(points to a camera on the shelf) is the Nikon F3, we just got that in, the beauty of this is the metering cell is now integrated within the body to handle both ambient as well as TTL flash metering. It’s genius! He pauses and looks over to Maria who is still watching him expressionlessly behind her sunglasses. He smiles at her then turns and pulls something off the back of a shelf before walking closer to her and kneeling down. DAVID: You know what my favourite is though? It’s this. He pulls a dusty Polaroid camera from behind his back. DAVID: You see the reason I like photo’s so much is because they capture time. They freeze moments, forever. And nothing can change that. And with this one you get to see that moment frozen, almost straight away. There’s something, something like magic about that don’t you think? He suddenly takes a picture of Maria who recoils in fear but does not run away. He then pulls it from the camera and flaps it about to dry it before handing it to her. DAVID: Though I’m not sure you want to be eh? The phone rings and David darts behind the counter to answer it leaving the camera by Maria’s side. Mrs Brenner and Harry re-enter, their laughter drowns out the rest of David’s conversation. Mrs Jones has two ornately carved wooden frames tucked under her arm. She looks at Maria disapprovingly and sighs. Maria is playing with the camera and does not look up. MRS BRENNER: I don’t know what to do with her, I really don’t. Harry lightly touches her shoulder and they exchange a glance. Camera pans round to David who is still on the phone. DAVID: Yeah, I understand that, but listen mate, too original? I mean surely that’s a good…yeah, yep, alright… Talk to you later mate. David who snaps his head up and forces a smile. DAVID: Good to see you again Mrs Brenner shall I wrap those for you? Maria and Mrs Brenner having left the shop are now hurrying down the street in a similar way to before. However Maria now clutches the Polaroid camera with her free hand. They both struggle up the garden path, Mrs Brenner opens the door, ushers Maria in, then slams it behind her. stairs Maria standing at the bottom staring up. We begin to hear the sounds of frenzied sobbing which gets louder. Screen splits, one half still on Maria the other showing the INT of Mrs Brenner’s bedroom. She lies, undignified, face down on the bed weeping. Maria slowly removes her sunglasses, brings the camera up to her face and takes a picture. Maria is on her knees and pulling out the boxes from beneath her bed, she pulls out a sand timer, stands it in the middle of the room and takes a picture. She looks at it and shakes her head and kicks it over. Maria running down the stairs. She opens the front door and we see her standing in the doorway. She takes a deep breath steps out, steps back in again, then steps out. She edges slowly down her garden path with the camera glued to her face; she stops to take a picture of a flower pushing its way up between the paving stones. This she puts into a satchel she carries. We see her edging down the street, at the end a car whizzes past her and she jumps back, we again see from her point of view as she begins to panic, she tries to hold the camera to her face, but seems to be dizzy and stumbles. She unsteadily sits on the pavement, and takes deep breaths to calm herself down. Eventually she shakes her head determinedly and gets up. She begins to walk slowly down the street and takes and picture of the sun which now glows between two chimney pots, she then begins to jog, and then begins to run. Maria running through a park, she is taking pictures of everything –an old couple on a bench, the tops of the trees, she leans over the side of a small bridge and takes a picture of the water flowing beneath it. Suddenly she stops still, and breathless, the camera is no longer on her face but by her side. 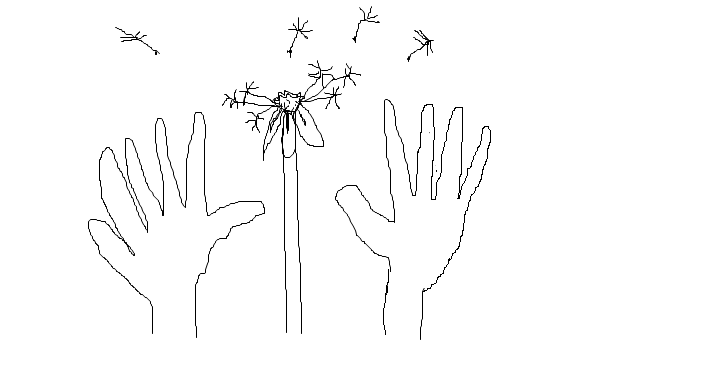 She kneels down and plucks a dandelion out of the ground, she blows on it and watches as the seeds gently float away. Slowly she raises the camera to her face and takes a picture. EXT: SHOPPING STREET. LATE AFTERNOON. Maria is walking along the street with a small white envelope in her hand. She stops outside the photo shop and we see her push it under the door. INT: HARRY’S PHOTOSHOP. LATE AFTERNOON. David sits behind the counter with his feet up looking bored. We see him notice as a white envelope is pushed under the door. Cautiously he picks it up turning it back and forth. He then opens it and pulls out the Polaroid of the dandelion seeds floating away. On the edge is written ‘THE TIME OF DAY’ He tips the envelope upside down and the dandelion stalk falls out onto his hand. He shakes his head and smiles. EXT. SHOPPING STREET. LATE AFTERNOON.